Anti-ageing is a part of medicine which studies the ageing process of tissues and suggests therapies to stop its advance. All human beings age when they arrive to adulthood. The degenerative process starts approximately at 25, when our growth ends. Ageing has no cure. But we can postpone its effects if we know how it is produced. Capenergy helps to fight against free radicals, the main responsible of the process, by generating an alternate electromagnetic field which deactivates the harmful power of free radicals. 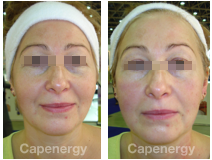 Besides, through its circulatory effect, Capenergy increases the amount of oxygen that arrives to the tissues, improving cell quality life. This fact has an impact on the whole body, providing health and vitality.